Today’s recipe was supposed to be for Father’s Day, but we couldn’t wait and cut into it early. It’s an ice cream pie – a type of dessert I don’t make very often. My feeling is that ice cream’s texture, temperature and taste make it a fulfilling sensory experience with no need for embellishment. However, there’s something to be said for transforming it into pie. The whipped cream and crust add a new level of textural interest, and the fact that you’ve gone to the trouble of building a thematic structure of flavors shows people you care enough to build them something which enhances the whole social aspect of whatever it is you’re celebrating. 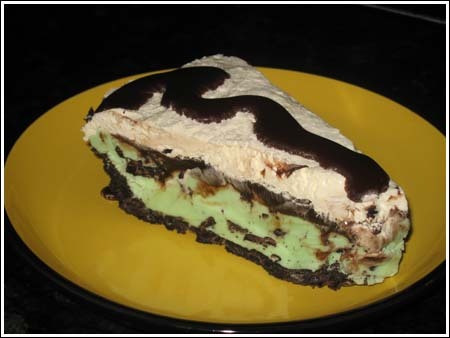 For this pie, I used an Oreo crust, a Dreyer’s mint chip ice cream filling and a layer of homemade chocolate fudge sauce topped with whipped cream. Usually we take our ice cream and eat it in separate rooms or in front of various media, but this time we all sat and ate it together at the table….because it was shaped like pie and meant to be special. Ice cream is not easy to photograph, but here’s a picture anyway. Don’t let my photo scare you away from making a delicious ice cream pie for your own family. Oh, and use whatever flavor ice cream you like. I used mint, because Todd and Fuzz like it and it goes well with chocolate. Next time, I plan on using coffee flavor. 1 cup whipping cream sweetened with 2-3 tablespoons powdered sugar and whipped or 3 cups Cool Whip. Prepare crust. Stir together crushed Oreos and butter. Press mixture into a greased 9 inch deep dish glass pie dish. Cover and place in freezer for about a half hour or until frozen. Spoon softened ice cream into pie dish and spread evenly over crust. Cover with foil (preferably non-stick) and freeze for another few hours or until ice cream is firm. Prepare sauce. In a 1 1/2 to 2 quart saucepan, stir together cocoa powder, brown sugar, syrup, cream, salt and half of the chocolate. Set the pan over medium heat and cook, stirring constantly, until chocolate melts and mixture begins to boil (bubbles will appear around side). Allow mixture to come to a low boil and cook for 5 minutes, stirring often. Remove from heat and stir in butter, remaining chocolate and vanilla. Let cool completely (takes a few hours). When fudge sauce is cool, spread a little over half of it (save the rest) evenly over ice cream in pie plate. Spread the whipped cream or Cool Whip over the fudge sauce. Return the entire pie to the freezer for 4 hours or overnight. Cover with non-stick foil or plastic wrap to avoid freezer burn. Steven, I’m glad you liked the fudge sauce! As for the pie, I guess it really depends on what brand of (or recipe) ice cream you use. One of these days I’d like to try it with homemade mint ice cream. I made this last week because I wanted something frozen. I was really impressed by the fudge sauce. That’s the best recipe I’ve seen for an ice cream topping. The rest of the pie worked out okay, but it didn’t blow anyone away except my dad, and he just loves ice cream. Thanks for all the comments everyone. Jen, Todd says thank you too. As for the Typekey account, I hate the fact that people have to register, but the spammers are very creative now. I turned the typekey authentication off for a few days last week and they went bananas. I finally signed up for a Typekey account…just to comment on your delicious blog. This ice cream pie looks soooo good! Happy belated Father’s Day to Todd! We think alike, Anna. I did a Pina Colada Ice Cream Pie for fathers day with a maadamia crust. Only had to light oven for 15 minutes for thecrust and even that was too long.